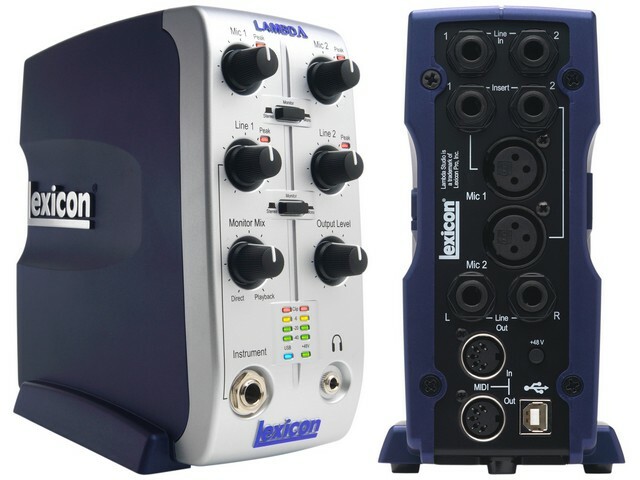 The Lambda Studio from Lexicon is extremely compact, desktop recording studio that includes a USB powered I/O mixer/interface with Cubase LE recording software from Steinberg and the Lexicon Pantheon VST reverb plug-in. The interface has five inputs with two channel recording and playback. It includes two studio quality balanced microphone inputs with phantom power for professional condenser microphones and channel inserts that allow for patching in outboard equipment such as compressors or equalizers. Balanced analog line outputs can connect to powered monitor speakers or a mastering deck. A separate headphone output provides the freedom to not only record but also mix anywhere. MIDI I/O is also included. Steinberg's Cubase LE production suite software for PC and Mac computers offers integrated multi-track recording, editing and mixing of up to forty-eight audio tracks, sixty-four MIDI tracks, VST instruments and plug-in support and an array of additional features. Lexicon's Pantheon VST reverb plug-in delivers lush Lexicon reverbs that have been used on professional recordings for over thirty years. Alternatively, the Lexicon Lambda Studio may be used as an interface with almost any other major audio recording software such as Steinberg Nuendo, Cubase SX, MOTU Digital Performer, GarageBand, Cakewalk Sonar and many others.